Certified Information Systems Auditor (CISA) is an audit professional certification sponsored by the Information Systems Audit and Control Association (ISACA). Candidates for the certification must meet requirements set by ISACA. The CISA certification is for IS audit, control, assurance and/or security professionals who wish to set themselves apart from their peers. The CISA certification has been renowned as the globally recognized achievement for those who control, monitor and assess an organization’s information technology and business systems. The CISA workshop covers 5 job practice areas essential for the protection of information systems, corporations and national infrastructure. These job practice areas provide participants with an extensive understanding of the technological & managerial factors that must coordinate effectively to keep information and systems secure. This workshop is meant for professionals responsible for controlling, monitoring and assessing an organization’s information technology and business systems. 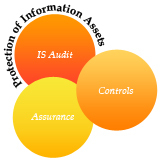 The CISA certification would immensely benefit those aspiring to make a career in Information Systems Audit. The CISA workshop covers 5 job practice areas outlined by ISACA. Each job practice area has a set of review questions followed by a mock exam on completion of the workshop.